Generally, the history of the piccolo parallels that of the flute but the piccolo didn’t receive the same attention until much later. There are many factors that may have delayed the development of the piccolo. One possible delay is that players could easily reach all of the tone holes unlike the much larger flute. Also, makers sought to enlarge the size of the tone holes on the flute in order to produce more robust sound and volume and this required key work to function properly. The tone hole size on the piccolo was more limited by its bore size. This meant that a player’s fingers could still cover the tone holes so there was no need for a mechanism to compensate. Additionally, the piccolo was quite challenging to work with. Any modifications on the half-sized instrument had far more profound effects, good or bad, and could ruin the instrument before it was even finished being made. Finally, the piccolo only truly found a consistent place in the orchestra in the middle of the 19th century so there wasn’t as much demand for the instrument. Some or all of these points may have deterred makers from experimenting on the piccolo. The flute received quite a bit of experimentation and thorough development over the years. 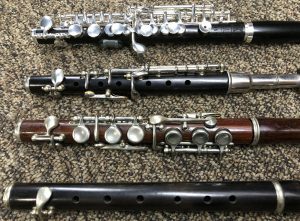 Numerous trill keys, advancements using pin-less mechanisms, head joint designs, and even the development of alternative mechanisms to include the quarter-tone key work have been applied to the flute. It has only been in the last 30 years or so that makers have really worked to bring some of these useful developments to the piccolo. The growing use of the piccolo in orchestral works, new compositions containing challenging technical passages, and the demands of modern performers have encouraged makers to push the development of the piccolo to new a new level. 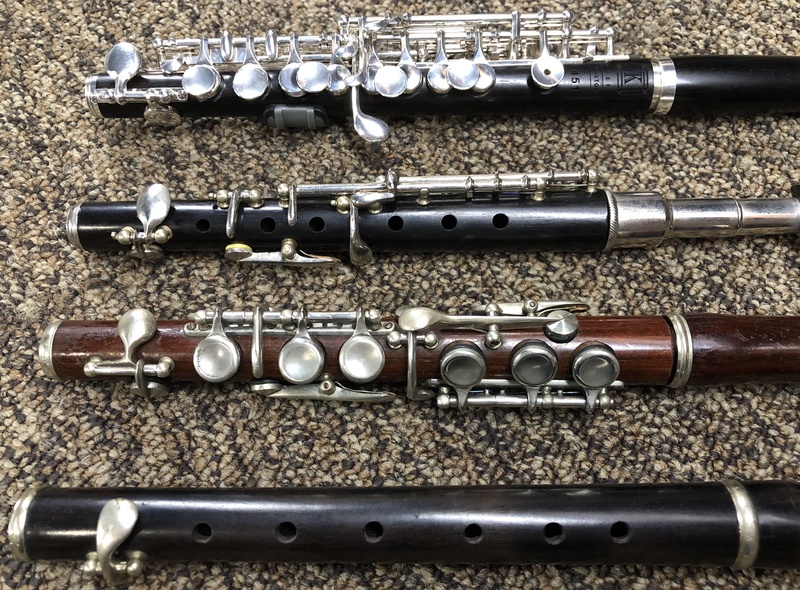 Even modern makers have found the size of the instrument challenging as there is not much room for additional keys but many of the mechanisms that have become standard on the flute are now available as options on some high-end piccolos. The C# trill mechanism places an additional key and tone hole in the space between the trill keys and thumb keys with the touch piece place by the Bb lever and operated by the right hand. This mechanism can be most welcome in some orchestral passages and is especially useful for the high G to A trill. This key work also allows for additional alternate fingerings and simplifies some trills and tremolos. The G-A Trill Key facilitates the trill between the high G and A which is quite difficult on the piccolo. The mechanism is similar to the C# trill mechanism but is more limited in its use. The Brossa F# is a small touch piece activated by the right hand, third finger that activates the F# key and allows for better venting of the note without covering additional tone holes. The Vented C key is a small hole through the C touch, similar to the vented keys on an oboe. The vented C key allows players to access high G at much softer dynamics without going flat. The key also has some use in pitch bending and timberal shifts. The Split E Mechanism has become a popular addition to many intermediate and professional level piccolos. This mechanism functions by allowing one of the two G keys to move independently of the other which then properly vents the high E.
Some makers have extended the range of the piccolo to include the C#, C, and B below the standard low D. There are some examples of historical instruments that were made down to the low C. Records suggest that a player in Sousa’s band owned such an instrument. The G# Facilitator articulates with the thumb keys and alters the venting height of the thumb keys making the high G# more responsive eliminating the need for the addition of fingers two and three of the right hand. The Quarter-tone Mechanism has been developed for the piccolo although, to this author’s knowledge, not readily available for purchase. Not all of these options are available on every make of piccolo. It is important to know how each of these options work and what benefits they offer.